Summary: The latest RNS from this antibody developer contained yet more bumper figures, and showcased impressive all-round growth and a record H1 operating margin of 79%. One startling achievement was that the extra £754k of revenue brought with it additional administrative expenses of only £1k. Progress may be interrupted later this year by the loss of certain product income, but the share price suggests there won’t be any problems with a new antibody about to launch. I have my fingers crossed everything works out, and continue to hold. These interim results extended the bumper annual figures issued during October. First-half growth was impressive, with revenue advancing 32% and operating profit surging 48%. BVXP allowed the numbers to do the talking, as the accompanying management narrative was very brief. Shareholders were told simply that progress was supported primarily by further demand for the group’s vitamin D antibody, with greater shipments of various antibodies to China also mentioned. The only other explanation for the welcome performance covered post-Brexit currency movements, which were said to have helped revenue gain between 15% and 20%. I was pleased BVXP’s brief narrative reconfirmed the promising potential of the upcoming troponin product. This particular antibody ought to be supplied to Siemens during the next financial year and is set to generate “significant revenue” for BVXP. There has been broker talk of annual product sales eventually reaching £2m or more. The troponin-related revenue is expected to counterbalance some £800k of income that will be lost from another product later in 2017. BVXP’s financials remain truly exceptional. The H1 operating margin was a super-sonic 79%, the highest ever for BVXP during the first half… and a smidgen off the 80% seen during the preceding second half. Given revenue advanced by £754k (to £3.1m), it was somewhat incredible that BVXP’s administrative expenses increased by only £1k (to £446k) during the half. With the gross margin improving from 89% to 93%, too, clearly there is a very favourable ‘operational gearing’ effect occurring here… whereby extra revenue is dropping straight through to profit. Elsewhere in the accounts, BVXP’s cash flow continues to wow me. During this first half, the £2.5m operating profit funded capital expenditure of just £10k as well as an unspecified £152k investment (my guess is this expense relates to one of BVXP’s collaborations in Norway). Furthermore, cash flow was helped by favourable working-capital movements combining to create a £29k cash inflow. The general lack of cash absorption meant this H1 £2.5m operating profit pretty much funded the entire £2.3m final and special dividends declared in October. The H1 dividend was lifted 21%, too. After paying tax of £415k, the cash position was left at £5.1m (equivalent to 101p per share). The balance sheet remains free of debt and defined-benefit pension complications. BVXP’s trailing operating profit is £4,924k if I adjust for a £76k foreign-exchange gain recorded during the preceding H2. 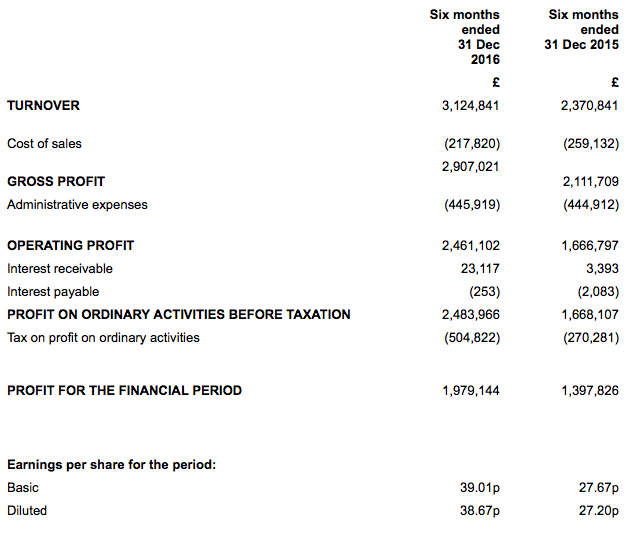 Applying tax at the 20% witnessed during this H1, I arrive at earnings of about £3.9m or approximately 77p per share. Then subtracting the 101p per share cash position from the 1,800p share price, my underlying trailing P/E comes to 1,699p/77p = 22. That multiple is not an obvious bargain, but may well be justified given the recent growth rate and the first-class finances. The valuation also suggests the aforementioned £800k loss of revenue will not be a problem. Nonetheless, I still have my fingers crossed that BVXP can continue to extract further growth from its vitamin D antibody… and soon enjoys a money-spinning launch of that new Siemens product. Meanwhile, the 47p per share ordinary dividend supports a yield of 2.6%. The Board is pleased to report that revenues for the financial year ended 30 June 2017 are expected to be marginally in excess of £7M (2015/16: £5.5M). Since the cost-base of the Company continues to follow a similar shallow trajectory as in previous years, both revenues and profits before tax are expected to be ahead of market expectations for the year ended 30 June 2017. The audited accounts for the year ended 30 June 2017 are due to be released on Monday 17 October 2017. We will comment on the revenues in more detail at this time. Revenue of £7m for the full year indicates H2 2017 revenue was £3,875k — up 23% on the £3,146k for H2 2016. Assuming the H2 gross margin matches that of H1 (93%) and H2 operating operating costs broadly match those of H1 (£450k) then H2 2017 operating profit could be £3,153k — up 38% on the £2,538k reported for H2 2016. These remain impressive rates of growth, although currency movements will have played a part given GBP was much stronger versus USD during H2 2016 than it was during H2 2017. Anyway, all those assumptions then point to full-year operating profit of £5,615k and earnings of £4,548k, or 89p per share after 19% standard tax. With the share price at £25, and adjusting for £1 per share of surplus cash on the balance sheet, I reckon BVXP’s P/E could be £24/89p = 27. So the group’s progress is certainly no market secret. Something to bear in mind is that BVXP is set to lose revenue of £800k in the current financial year following the expiry of a royalty agreement. Revenue from the new troponin product is expected to replace some of that income, but whether it replaces it all is up for debate. I look forward to BVXP commenting on its revenues “in more detail” within its October results. PS As an aside, I have recently spent two weeks in hospital during which time I observed how frequently blood tests are taken on all patients. The impression I formed is that medical staff would rather request a blood test just in case, which bodes well for supplies of blood-test antibodies I guess.